Pick up a selection of bright nail varnishes from a discount store and have fun painting stones. The nail varnish dries quickly with a shiny waterproof finish. My kids like using the little brushes and bright little bottles. Just be sure to supervise closely throughout with younger kids. Put the stones on paper plates or lay down some newspaper. 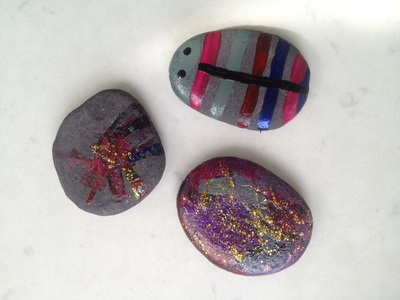 Let kids paint the stones using the nail varnishes. They could make little creatures, paint houses or scenes, or just have fun with different patterns. What will you do with your painted stones? How about painting lots and displaying them in a bowl or jar?